Amazing Vietnam travel package offers chances to discover all the top Vietnam destinations: Old historic Hanoi, easy trekking in the heaven kingdom of natural scenery - Sapa, amazing Halong Bay - UNESCO natural heritage site and 2 cultural heritage sites - Poetic Hue and charming Hoi An. 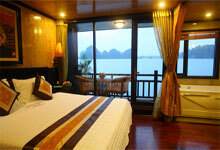 Limited offers for the best of Vietnam travel packages. Trip name: Jewels of Vietnam. Our guide picks up you at the airport and transfer to your hotel for overnight . Discover thousand year old capital of Vietnam: first stop at Temple of Literature(First University built in 1070 AD), Ho Chi Minh Mausoleum, his house on stilt and beautiful botanic garden. Then, one Pillar Pagoda with unique buddhism architecture. Arrive in Laocai station at 05:00 am. Drive to amazing Sapa - the Queen of all Vietnam holiday packages. The land of 7 colourful ethnic minorities in simple lifestyle and very basic living conditions will enrich your lifetime travel experience. After breakfast, trek to Cat Cat village(2 km from Sapa town). Visit a cottage house of Black H’mong people to experience their lifestyle. Mix yourself with the beautiful scenery of Sapa Valley. Back to your hotel. Departure for My Tho, located on the northern bank of Mekong river. It takes about 2 hour drive from Saigon. On arrival, cruise the Mekong River and visit an orchard on an island. Continue visiting a snake farm and then drive to hotel for check in and overnight(Meals: B/L). Book the amazing Vietnam travel package to highlight your lifetime travel experience. If not fully satisfied with the trip, you will have money back. Limited offers.